HI, I have used DIveLog 5.0 and the Iphone version and have been very very satisfied with both. The iPhone version has the same interface so I do not have to even look for menus and has the same data available. Together they are a joy to use. Now I have gone to Android as I got fed up with Apple ways of doing updates and messing up my phone. Under Android I have tried the 3 Apps that can sync with Dive Log 5.x but I have to admit they are very inferior to the iPhone version. Their interface is nowhere near as good, their export method is like going back to days of DOS operating system and some important data is not exported either. I have tried to contact the iPhone developer to see if they are planning to develope the Android version but they said no for now. I think we should get together as a user community and put some presure on them to rethink their development strategy. Thank you, I'm glad you like Diving Log! For iPhone and Android I'm cooperating with 3rd party developers, so I don't have much influence here. I'm doing myself only the Windows Phone version. The problem with Android is in my opinion the development system, which I think is not as good as the developer tools for iOS and Windows Phone. There is only so much a developer can do and I think I wouldn't be able to create a nice UI on Android either. A developer has to work with the available tools and I've tried different Android IDE's myself and to be honest, I don't like any of them. Coming from Visual Studio it felt like several steps backwards. Creating a complex app like Dive Log for iOS or Diving Log for Windows Phone would be rather cumbersome on Android. You can see that also on other non high profile apps on Android, most of them are not as nice as on iOS or Windows Phone. I'm the same as for as Apple is concerned. While I love the MAC I've recently ditched my iPhone. It's just not going anywhere while at the same time Android is pushing ahead. Being on a MAC of course it means I can't synch dive log AT ALL with my new Android phone so I'm forced to keep my iPad alive for now. I think sooner or later someone is going to develop something better on the Android it really is just a matter of time now. That said though there is work that can be done on the MAC desktop version so that you can at least export a file to an Android device which you can't even do currently. At least that would be a half-step in the right direction. Right now the MAC version can only synch with Apple products and thats really not good enough any more so it would be good to see an update to the MAC desktop version that gave you a little more freedom. I agree that the apps for the Android currently are really not that good (unless someone has come across something brilliant recently), but I honestly think that will change although how soon remains to be seen. So ... developers, any chance you could bring a little more freedom to the MAC desktop version of Dive Log? 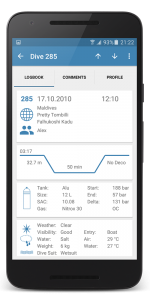 Please note that I'm not the developer of Dive Log Manager for Mac OS or the iOS Dive Log, so your feedback regarding Android syncing with Mac OS is better placed here. But as I've written in your other posting, theoretically data exchange should be possible, however I've never tried that. The new Android interface is really the bare minimum compared to the IPhone! The GPS location when adding a dive site does not work either. When is there another update planned? Can they get any closser to the IPhone version? The Android interface is frustrating to work with after using the Iphone version for the past 4 years! Please make it beter. Please keep in mind the iPhone version was released 6 years ago and it is from a different company. It takes time to add all features to the Android app. The GPS location works on my device, please make sure you've allowed the app accessing the location service.